It's raining this morning as we walk from the hotel to the underground parking lot to pick up our rental car. The clouds are low and heavy and the rain falls in a steady stream. It's not light yet, but we have adjusted quickly to the new time zone. After yesterday's morning meetings and our beautiful afternoon hike to Coronet Peak we are excited to continue our adventures. Today is going to be awesome! As we were looking for fun things to do this trip in Queenstown and the surrounding area the Via Ferrata of Wild Wire caught my eye. Billed as the "highest waterfall via ferrata in the world" it sounded right up our alley. Linda and I got hooked on via ferrata through a friend that had lived in Europe. Via Ferrata most often is interpreted as "iron path" which is indicative of the iron rungs used to aid in the climb. A steel cable is placed along the rungs and is anchored into the rock face every few feet to limit the drop should a climber fall. The best part about via ferrata is it allows less skilled hikers/scramblers to go places generally reserved for only skilled climbing. We rented harnesses and equipment in Switzerland and climbed Piz Trovat without any assistance or instruction. We survived and are excited for a repeat of the experience today. Our wipers thump to the beat of the steady stream of rain as we make the hour drive to Wanaka and our meeting with the Wild Wire tour group. About 10 minutes from our destination a text message arrives that the tour has been cancelled due to rain. I guess I'm not surprised as we drive into Wanaka with nothing to do. Wanaka is a beautiful little town that sits on the edge of Mount Aspiring National Park and is a resort town during both summer and winter seasons. Ski resorts dot the surrounding mountains and Lake Wanaka washes right up on the shores of the town. We drive along the shore and decide to locate our meeting place for tomorrow. Instead of cancelling our climb with Wild Wire we postponed it until tomorrow. Same time, same place. We park and walk along the stores and shops facing the lake. A pie shop catches my eye, always on the look out for "best of" anything type awards posted in windows, this shop has a dozen stickers for "best pie" over the past dozen years or so. Pie shops in New Zealand are different, they are small individual pies and are made with meat, egg, and just about everything else. We both get two types of pie. The Chicken and something is awesome as we sit outside with jackets on watching the steam roll off our breakfast. I had downloaded two mountain peaks in the area, but all are equal to the Coronet hike we did yesterday. Higher elevation and strenuous. Neither of which we wanted to do today. I pulled up Peakbagger.com and within a short drive is a ranked peak called Mount Iron. We decide that will suffice for the day and wander back to the car. The trailhead is close, but unusual as we drive through subdivisions to reach a small road with no parking. Only one van is in the area as we back up and pull as far off the road as possible. Something isn't quite right, but the trailhead is here as we start our climb. 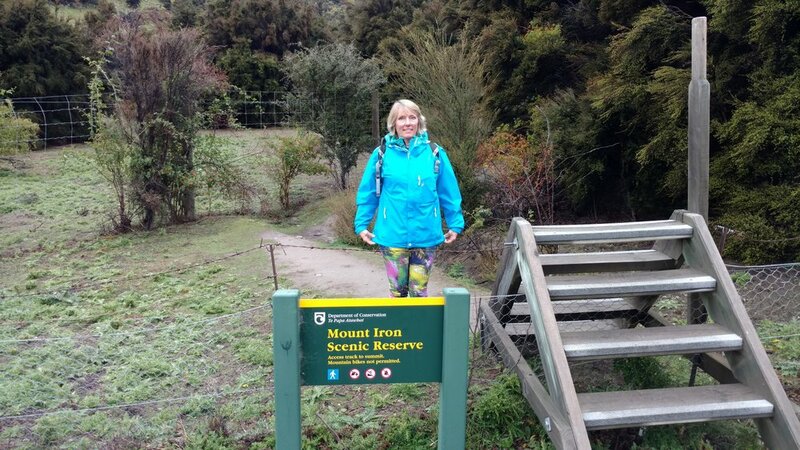 With rain jackets on we hike through the scenic reserve along a wide trail. Obviously a road at one point the brush and vegetation is dense and beautiful in areas. The rain clouds move across the small mountain as we catch glimpses of the town and valley below. We connect with another trail as we realize our trailhead is not the main trailhead for the hike. Mystery solved, we hike through the scrub oak and vegetation. We meet a large number of individuals and groups going the opposite direction and we come to realize that this is a very popular trail. Speed walkers, runners and groups with children are all enjoying the rainy day on Mount Iron. This close to town, I can see why the various groups are enjoying the exercise and relative solitude of the outdoors. 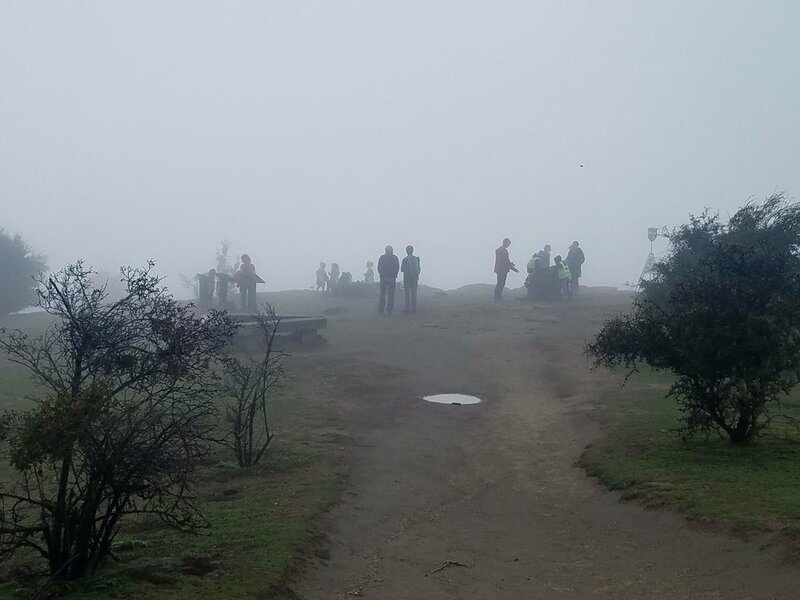 We reach the summit in a blanket of fog and find a bench to enjoy a snack. More groups arrive on the summit and it is easy to note that we are moving "against" traffic. We continue on but soon find an information sign that outlines the entire loop. It is way longer than we want to hike in the rain and fog. Reversing our course we move with the groups back along the route to our connecting trail. The only other vehicle is gone and our rental car sits alone on the road. Mount Iron rests between Wanaka and Albert Town and as we consult the map we decide to loop along Highway 6 instead of backtracking through Wanaka. Highway 6 travels along the river delta connecting Lake Wanaka with Lake Dunstan and we stop at the Gibbston Valley Winery for a break. We don't drink wine, but the winery has cheeses and an assortment of gifts in the shop. We buy the customary gifts for people at home. Dropping through the Kawarau Gorge we arrive back at our hotel in time to shower change and get ready for tonight's Theme Evening. The business portion of our trip always provides a Theme Evening of something unique and spectacular to the Area. Ten years ago it was panning for gold and fantastic music and dancing in Arrowtown. Linda and I both smile and chuckle as the bus pulls into the Gibbston Valley Winery for tonights dinner and tour Theme Evening.